Endoscopic retrograde cholangiopancreatography (ERCP) is an endoscopic procedure whereby a side-viewing upper endoscope is guided into the first pat of the small intestine (duodenum), letting instrument to be passed into the bile duct and pancreatic ducts. These ducts are opacified by injection of a contrast medium, that can be seen radiologically, to help in a wide variety of therapeutic/diagnostic interventions. 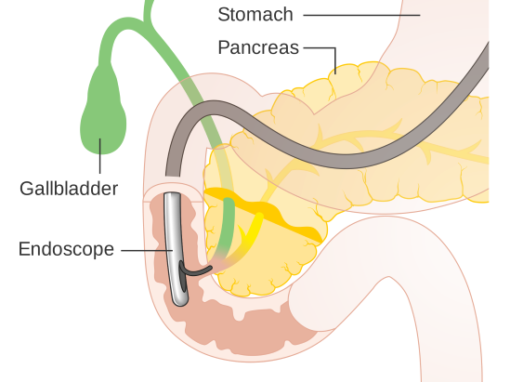 ERCP is a complex endoscopic procedure done by a gastroenterologist with specialized training. The advantage of this procedure is that it is minimally invasive to the biliary and pancreatic duct but yet pose a risk for serious complications. ERCP, magnetic resonance cholangiopancreatography (MRCP), and endoscopic ultrasonography (EUS) have comparable sensitivity and specificity in the diagnosis of choledocholithiasis (gallstone in the common bile duct). ERCP plus sphincterotomy with simultaneous stone removal is an important treatment option for choledocholithiasis patients with jaundice, imaging showing dilated common bile duct, acute pancreatitis, or cholangitis. In patients with pancreatic or biliary cancer, the principal advantage of ERCP is palliation of biliary obstruction when surgery is not elected. Tissue sampling/biopy for patients with pancreatic/biliary cancer not will to undergo surgery. ERCP is the most accurate approach for diagnosis of ampullary cancers. ERCP has no role in the diagnosis of acute pancreatitis unless there is biliary pancreatitis and early intervention can reduce mortality and morbidity. Evaluation of abdominal pain of obscure origin in the absence of objective findings that suggest biliary or pancreatic disease. Magnetic resonance cholangiopancreatography and EUS are safe diagnostic procedures that can obviate the need for ERCP. Prior to laparoscopic cholecystectomy in the absence of signs of biliary obstruction. Evaluation of suspected gallbladder disease without evidence of bile duct disease. As further evaluation of proven pancreatic malignancy unless management will be altered.